Remember the episodes of Seinfeld where Elaine would exclaim “GET OUT” while forcefully shoving another character in the chest using her hands? These cookies deserve one of those “GET OUT” moments. 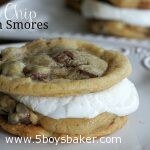 A warm chocolate chip cookies, a layer of chocolate chip cookie dough, followed by gooey marshmallow, and another warm chocolate chip cookie . . . . what’s not to love? Get out your fat pants or your running shoes, because your going to need them after making these cookies. Preheat oven to 375. Line cookie sheets with parchment paper. In a medium bowl, beat butter and sugars at medium speed with an electric mixer until fluffy. Add eggs and vanilla, beat well. In a medium bowl, combine flour, salt, baking powder, and baking soda; gradually add to butter mixture, beating until well combined. Stir in chocolate chips. Cover dough with plastic wrap and chill for 1 hour. Reserve one-third of cookie dough and cover and refrigerate. Drop remaining dough by rounded tablespoonfuls, 2 inches apart, onto prepared cookie sheets. Bake for 12 to 14 minutes or until lightly browned. Let cook on pan for 2 minutes. Remove from pans and cool completely on wire racks. Preheat oven to 450 degrees. Line cookie sheets with parchment paper. Place 18 cookies, rounded side down on cookie sheet. Place 1 tablespoons of reserved cookie dough on middle of cookie, flatten dough, leaving a 1/2-inch border. Place one marshmallow on center of cookie dough. Bake for 5 minutes or until marshmallow is melted and lightly browned. Place remaining cookies, flat-side down, on top of marshmallows.